A typical shop broom is made without color and with a 42 inch handle, but this family (just the son with the broom) wanted a BROOM! and I aim to please. 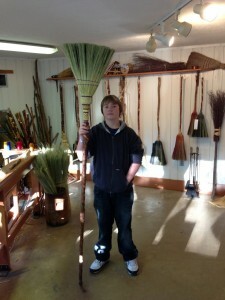 This shop broom features 2 pounds of broomcorn on a 60 inch twisted sassafras handle. My shop at home has a rather rough concrete floor, and, when we work out there, we generate a lot of sawdust, wood shavings, broomcorn trimmings, etc. Now, cleaning the floor of this space doesn’t happen as often as it should, but when it does happen, we want it to happen fast and we aren’t terribly concerned if it’s sterile when we’re finished. This is the space that we developed the shop broom for. The shop broom is heavy and wide with stiff tips and it moves a lot of debris very quickly. We take a large handle, still typically just 42 inch in length, and bind on all craft broomcorn in 6 layers. The first 5 layers are bound with wire, and the last with sturdy twine and is braided on. Because we use all craft broomcorn in this broom and trim it when we’re finished, the tips are not as feathery as the kitchen and parlor brooms we make. We also work in another wrap just above the stitching and use only 2 rows of stitching way up high on the sweep to make it fan out widely. It’s also great on patios and decks to get the leaves or pine needles!